For warranty coverage of products of third parties resold through TEI, please contact the Original Equipment Manufacturer (OEM) or third-party vendor directly. All Product Categories – Rust and/or corrosion of any Product and/or associated mounting hardware. This exception also applies to all Products which are recommended for outdoor applications. 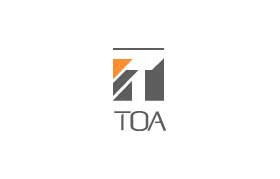 Batteries – Battery failures: TOA will replace failed batteries within 60 days from the date of Product purchase. Purchaser should contact a TOA Authorized Reseller to arrange for the replacement. All claims under this Limited Product Warranty must be for covered problems and must be made during the applicable warranty period. To make a claim, Purchaser must return the Product, freight prepaid, to TEI’s Service Center under a Return Merchandise Authorization issued by TEI in accordance with its then currently published procedure. The Product must be returned in either its original carton or a similar package affording an equal degree of protection. TEI will return the repaired Product freight prepaid to Purchaser. Unless the Product is covered by the Advance Replacement Policy then currently in effect by TEI, if any, TEI is not obligated to provide Purchaser with a substitute product during the warranty period or at any other time. Eastern Time Zone – 8:00 AM – 5:00 PM, Mon. – Fri.
Pacific Time Zone – 8:00 AM – 5:00 PM, Mon. – Fri.
Emails should include the following basic contact information: Customer Name, Company or Organization Name and Telephone Number. 1. INVESTIGATION: TEI will reasonably investigate the Purchaser’s claim. If after investigation TEI determines that the reported problem was not covered by this warranty, Purchaser will pay TEI for the cost of investigating the problem at TEI’s then prevailing per incident testing fee and all shipping costs incurred by TEI. No repair or replacement of any Product or part thereof will extend the applicable warranty period for the entire Product. The specific warranty for any repair will extend for a period of ninety (90) days following the repair or the remaining warranty period for the Product, whichever is longer. 2. EXCLUSIVE REMEDY; ACCEPTANCE: Purchaser’s exclusive remedy and TEI’s sole obligation under this warranty is to supply (or pay for) all labor necessary to repair any Product found to be defective in material or workmanship within the warranty period and to supply, at no extra charge, new or rebuilt replacements for defective parts. If repair or replacement fails to remedy the problem, then and only in such event will TEI refund to Purchaser the purchase price for the Product. Purchaser’s failure to make a claim as provided herein or continued use of the Product will constitute an unqualified acceptance of the Product and a waiver by Purchaser of all warranty claims with respect thereto. 3. EXCEPTIONS TO LIMITED WARRANTY: In addition to the specific exceptions to warranty coverage noted herein, TEI has no liability or obligation to Purchaser under this warranty with respect to any Product which is subjected to any of the following: abuse, improper use, negligence, accident, modification, failure of the end-user to follow the operating procedures outlined in the user manual for the Product, failure of the end-user to follow the maintenance procedures in the service manual for the Product where a schedule is specified for regular replacement or maintenance or cleaning of certain parts (based on usage) and the end-user has failed to follow such schedule; attempted repair by non-qualified personnel; operation of the Product outside of the published environmental and electrical parameters, or if the Product’s original identification (trademark, serial number) markings have been defaced, altered, or removed. TEI expressly excludes from warranty coverage Products sold by TEI “AS IS” and/or “WITH ALL FAULTS” and consumable items such as fuses and, except as noted above, batteries. All software and accompanying documentation furnished with, or as part of the Product is furnished AS IS and without any warranty of any kind, except as expressly provided in any documentation or license agreement furnished with the Product. 4. AVOIDING DATA LOSS: Purchaser is solely responsible for maintaining any backup which may be necessary to replace any data stored in the Product and which could be lost or damaged from any cause. 5. PROOF OF PURCHASE: Purchaser’s dated bill of sale for the Product must be retained as evidence of the date of purchase and to establish warranty eligibility. 6. PRODUCT REGISTRATION: Registration of the Product or of this warranty is voluntary and Purchaser’s failure to register will not diminish any rights available hereunder. THE LIABILITY OF TEI, IF ANY, AND PURCHASER’S SOLE AND EXCLUSIVE REMEDY FOR DAMAGES FOR ANY CLAIM OF ANY KIND WHATSOEVER REGARDING THE PRODUCT, REGARDLESS OF THE LEGAL THEORY AND WHETHER ARISING IN TORT OR CONTRACT, WILL NOT BE GREATER THAN THE ACTUAL PURCHASE PRICE OF THE PRODUCT WITH RESPECT TO WHICH SUCH CLAIM IS MADE. IN NO EVENT WILL TEI BE LIABLE TO PURCHASER FOR ANY SPECIAL, INDIRECT, INCIDENTAL, OR CONSEQUENTIAL DAMAGES OF ANY KIND INCLUDING, BUT NOT LIMITED TO, COMPENSATION, REIMBURSEMENT OR DAMAGES ON ACCOUNT OF THE LOSS OF PRESENT OR PROSPECTIVE PROFITS OR FOR ANY OTHER REASON WHATSOEVER REGARDING THE PRODUCT. For TEI’S Service Facility in the United States please contact: TEI Product Support Group at 800-733-4748 or by email at: psg@toaelectronics.com. 4) If the product status is “In Warranty” or “Out of Warranty”. If the product was sold as TOA brand “A” Stock and you do not have a copy of the “Invoice” or “Bill of Sale” we will use the manufacturing date code and provide “In Warranty” repair service for the product warranty time period + (6) six calendar months. If the product was sold as TOA brand “B” Stock or Non-TOA branded product to obtain “In Warranty” repair you will be required to provide a copy of your “Invoice” or “Bill of Sale” to the repair center agent via Fax, Email or Postal Service so that the warranty status can be determined prior to your shipping the product to the factory repair center. If the product is determined to be “Out of Warranty” you will be referred to the local (independently owned and operated) TOA Preferred Repair Center or you can choose to send the product to the TOA Factory Repair Center. Note: Attempted delivery of products to the repair center without authorized preapproval will be refused. All products must be shipped into and out of the repair center as we do not provide a “Will-Call” area for product drop-off or pick-up. The repair center is not responsible in the event the product is physically damaged during shipment. The repair center will contact the customer and advise them to initiate a damage claim with the shipping company. The Customer is responsible for all products received by the repair center with shipping damage. It is the customer’s responsibility to settle the shipping damage claim with the shipper. TOA Electronics, Inc. is not responsible for any shipping damage. Shipping charges are the responsibility of the customer for all products shipping into the repair center. The customer shall be responsible for all return shipping charges to and from the repair center for all “Out of Warranty” product repairs. The repair center will pay shipping charges for “In Warranty” product repairs shipping back to the customer via UPS Standard Ground service – without insurance. Customers may request shipping insurance coverage but will be required to pay for the insurance prior to shipment.